I never knew you could have so many back issues, until I became a parent. Between working long hours at a desk, typing away all day and caring for a small, there are days my neck and shoulders at screaming. But is it realistic to get daily massages? Nope. There is no time for it and it’s financially unrealistic. So what’s an alternative? Home massagers. I’ve tried a few different brands of home massagers and I can honestly say the Naturalico Shiatsu Massager is unlike any of the other massagers I have used. Naturalico gave us handles! Do you know how frustrating it is trying to strap a massager to a chair? It’s difficult and they always end up slipping. Now you don’t have to secure it to a chair. Simply, hold on to the handles. This also help you control the pressure you want too! Another feature I really like is the location of the control panel. It’s in the handle, right at your fingertips. Now you can turn the heat on or off and even the massager on and off. This makes positioning the massager a snap. No more trying to align it to a sore spot, while it’s on. When I was opening the shiatsu massager I saw there were TWO power cords! One, I can use in the house or anywhere a standard power outlet is available. The other I can use in the car!! We are going camping this weekend and after lugging everything to the campsite and setting up sometimes I am very sore. How nice will it be to know I can run back to the car and take a little break with the Shiatsu Massager? We often take road trips, like really long road trip. Now if my shoulders are starting to tire or stiffen up I can pull over and take a little 10-15 minute break to help loosen those muscles up. 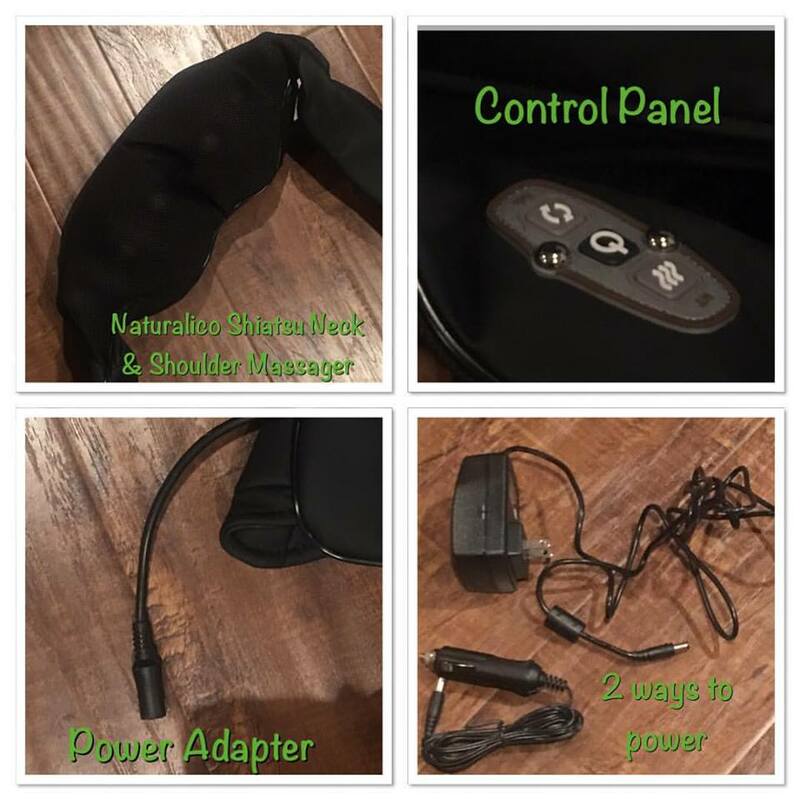 I have been very pleased with the Naturalico Shiatsu Shoulder and Neck Massager. Has features that other massagers do not have. And I just love the power adapter!